Guest Post from Peter: What’s It Going to Take? Peter writes The Carey Adventures and takes amazing photographs. This is him being a dad blogger. 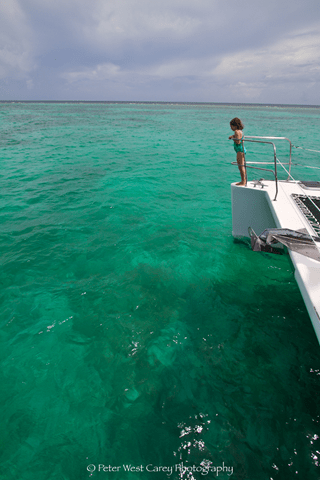 She is on the back step of the catamaran, snorkel in her mouth, dive mask on and life vest firmly strapped to her chest. But my eight year old daughter wouldn’t budge. This is one of the reasons we came to Mexico and she loves water as much as I do, regularly complaining when she has to get out of the tub, the pool or even a puddle. So why wouldn’t she just jump in? “Come on, Honey, I know you can do it. I even left the camera on the boat so I could be right here with you.” I was sure this line would work. After all, she knew how much I loved photography and always had a camera in my hands. And here I was giving up that which I held so dear JUST FOR HER! I’m sure it had to have some impact on her confidence and my devotion to her. “My Dad loves me more than his camera!” I know, it is screwed up, but I hoped that would be resonating in her head. No budge. An even some tears starting. Louis, our guide, floats over and hands her a crystal clear shell. Her eyes widen a bit and her attention is diverted for a second (no, I didn’t push her in at this point if that’s what you are thinking). He’s really trying hard to help her like this slice of the Caribbean. Not too pushy. Slowly she slides into the water with a death-grip on the swim step. Louis brings over a float ring for her to hold onto when she’s away from the boat. I ask, in the patient voice I’ve learned to cultivate, “Honey, you want to go see the reef, right?” A slow nod with fingers turning white from the grip. “Is something scaring you?” Another nod and she spits out her snorkel, “I’m afraid of sharks.” This, I did not know. Upon returning home I found out she had watched one of the Planet Earth episodes before she left. The one with great whites in it. Breathe, Peter, breathe. Louis assures her there are no sharks in this area. And now the Dad conundrum. Do I agree with his lie (there are sharks in the general area, but likely not right where we are right now) or….. Of course I go with the lie. You would too. You have too. Do you know how hard it is to flip a coin in the water and figure something out like that in a millisecond? Defer to the expert, even if you think he might have spent too much time in the sun most of his life. The group returns. And I think some tears do too. “I want to see the reef”. My heart breaks a little. There was a day many years ago I would have leveled a, “Well it’s too damn late”, but not today. I know something is holding her back and she doesn’t like it. I didn’t figure I was heading to Mexico to help her work on fears and gain self-confidence, but it turns out that’s the lesson for the day. “I know, Honey,” is what I respond. We climb back into the boat to head for the second snorkel spot. She sits close to me on deck, not saying much. I breathe in more patience as we head into the water for the second swim, much closer to the reef. This time everyone bolts away from the boat fairly quickly as Sabrina is grabbing the life-ring with confidence this time. I’m wondering if we’ll be left tagged to the boat for this swim too. “Look! There are fish right over here!” our guide yells. Big eyes and a push off of the boat. “DADA! Look! !” Fish are swarming around us as we head out and around the boat for open waters. And she doesn’t care because, you know, THERE ARE FISHYS!! “I touched one!! Dada, I pet one! !” The life-ring is left behind as both hands are busy in the water. And the reward for my patience? Hearing my now confident daughter giggle through a snorkel. Where I live there is this rite of passage for 5-6 year olds, jumping off the dock at the lake beaches. I've seen some great and bad parents try to coax their children off of the dock. That fear those kids have is important and so is jumping over that hurdle. It's good to reflect on this just as you did here. Good job! I have an 8 year old son, and your post had me saying "Oh man, I know EXACTLY how that is". A little patience, and some re-direction, sure go a long way. Thanks for sharing this great story. I'm glad she took the plunge, so to speak. What a beautiful story, and a beautiful memory. It's not easy to keep the patience the way you did, so kudos to you!